Eurocell – the UK’s leading manufacturer, distributor and recycler of window, door, conservatory and roofline products – has reconfigured its popular Dales Collection range of composite doors to increase and improve aesthetic choice, security and resilience. First, the company has introduced three new panel designs – the Elton, Hartington and Newhaven – which deliver ‘on trend’ farmhouse and contemporary styles. The three designs are complemented by six further glass patterns to further increase choice for the specifier, developer and end-user. The additional door and glass introductions bring the total of Dales Collection front and back composite door combinations to 15 styles in 15 colours and 18 glazing options, from modern ‘chic’ to traditional Edwardian or cottage style. The colours are in three groups: Contemporary, e.g. Anthracite Grey, Slate Grey and Moondust Grey; Standard, e.g. Rosewood, Golden Oak, Frost White and Berry Red; and Heritage, e.g. Eurocell Cream, Chartwell Green and Duck Egg Blue (all made to order). Dales Collection doors are also available with colour-matched weather bars. Second, with security and peace of mind very much on the agenda, not least following the introduction of Approved Document Q (AD Q) of the Building Regulations in October 2015, Eurocell has improved both the structural stability of its door panels and its locking hardware. AD Q sets out what it says are “reasonable standards for doors and windows to resist physical attack by a casual or opportunist burglar by being both sufficiently robust and fitted with appropriate hardware” and effectively excludes non-PAS 24 products from the new build sector. A new accredited five-point multi-locking system with adjustable keeps has been introduced, providing an improved weather rating that can now achieve up to a massive 1200 Pascals – a 50% improvement on previous tests. The new improved design also includes an increase of the outer GRP skin thickness from 2mm to 4mm. The collection is now fitted with the Tri-Sis glazing cassette which can be deglazed internally without damaging the door panel or affecting the security performance of the door overall. The locking system, plus the thickness and glazing modifications, means that the new doors are all now compliant with the requirements of AD Q; achieving PAS 23/24:2016 accreditation, which includes the challenging PAS 24:2016 ‘Cut Through’ test. GRP door leaves obviate splits or cracks and are less prone to scratching and denting than steel-faced doors. A high-quality triple-seal frame system ensures Dales Collection doors can give outstanding performance for many years and two brush seals and a gasket seal prevent drafts and rain causing problems. In terms of energy efficiency and sustainability, The Dales Collection composite doors range is ‘B’ rated as standard but ‘A’ rated is also available. 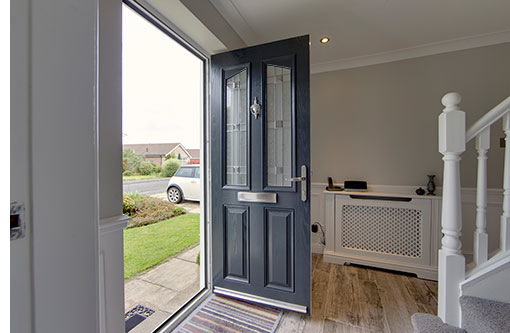 GRP-faced PVC-U composite doors continue to dominate the UK entrance doors sector; made popular by their greater security, thermal performance, fire resistance and aesthetic variety. The Dales Collection is the acme of these products: offering specifiers, housebuilders, social landlords and homeowners superb choice, performance and looks.